Soopa Nutritional Topping is a mix-in meal supplement made from superfood ingredients to complement your dog’s complete food, and to help maintain healthy digestion. Suitable for all dogs including those that suffer from obesity, allergies, pancreatitis, or low immunity. What are Soopa Nutritional Toppings? Soopa Nutritional Topping is a mix-in meal supplement made from superfood ingredients to complement your dog’s complete food. The added prebiotic fibre helps to support a healthy digestive system. As it is so tasty, it is a great way to encourage fussy eaters too. Spinach is a truly sensational superfood as it is rich in calcium and Vitamin-K. These help to maintain good bone health and growth. Pumpkin is full of anti-oxidants, vitamins, minerals, and fibre – this also helps aid digestion and makes pumpkin an all-round great ingredient! Coconut oil is a superfood that is rich in MCT’s. studies have found that MCTs help boost your dog’s brain power, while psyllium husk is an excellent source of fibre to help keep your dog healthy and happy. Suitable for all dogs including those that suffer from obesity, allergies, pancreatitis, or low immunity. What are the benefits of using Soopa Nutritional Toppings? 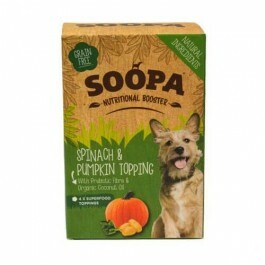 What is in Soopa Spinach & Pumpkin Nutritional Topping? Ingredients: Potato, Pumpkin, Spinach, Organic Coconut Oil, Limestone (natural source of calcium), Psyllium Husk. Analysis (Values per 100g):Crude Protein 1.0%, Oil/Fat 2.0%, Crude Fibre 2.0%, Ash 2.6%, Moisture 87.0%.